Aci Castello is a nice fishing village located on the Eastern coast of Sicily. Its name derives from the castle set on he rocky volcanic hill, built by the Normans in 1076. 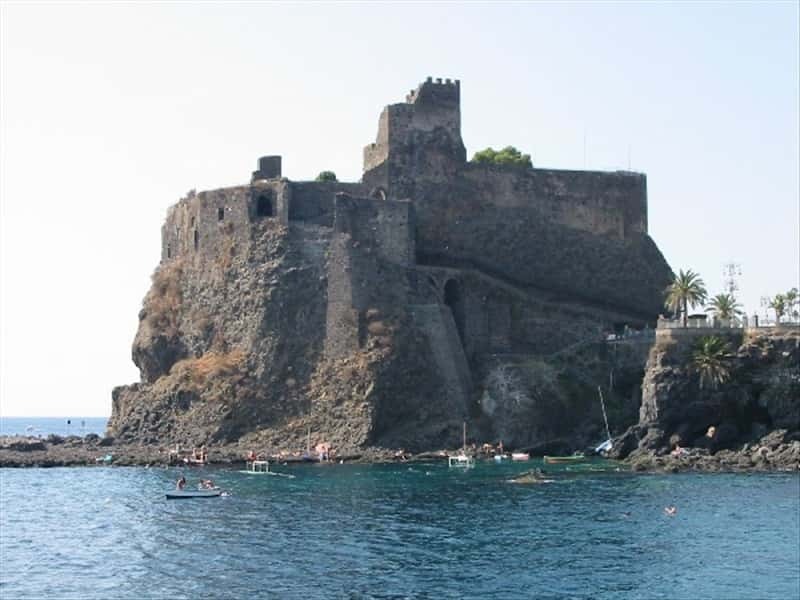 The first suburb was founded around the castle and was bestowed to the Bishops of Catania by the Norman Count Ruggero. Approximately in 1170, it was completely destroyed by a devastating earthquake, and was repopulated no sooner than 1530, as the nearby towns of Ficarazzi and Aci Trezza were annexed. The most architecturally interesting monuments are the Chiesa Madre, preserving noteworthy frescoes by Pietro Vasta (1697-1760), and the Norman Castle, today dwelling of a Museum, built with lava rock from mountain Etna. Aci Trezza, hamlet of Aci Castello, is also famous because Giovanni Verga's famous novel "I Malavoglia" was set there. This town web page has been visited 37,013 times.